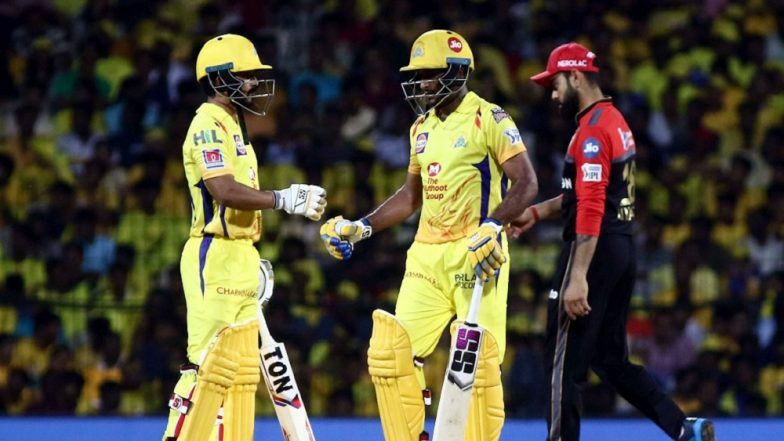 New Delhi, March 25: The first match of the Indian Premier League (IPL) saw Chennai Super Kings bundling out Royal Challengers Bangalore (RCB) for just 70 runs at the MA Chidambaram Stadium in Chennai on Saturday. While both CSK skipper M.S. Dhoni and his RCB counterpart Virat Kohli said that the pitch wasn't how they had expected it to be, former Australia and CSK opener Mathew Hayden called it "below standard". The Board of Control for Cricket in India (BCCI) has now asked the IPL franchises to prepare sporting wickets for the rest of the tournament. Speaking to IANS, a senior BCCI official said that while the board doesn't interfere with the wickets prepared during the popular T20 league, it should not be heavily tilted towards either the batsmen or the bowlers. "The franchises have the freedom to prepare wickets without the interference of the BCCI, but the wickets should be sporting and not heavily titled in favour of either the batsmen or bowlers," the official said. LIVE RR 18/0 in 2 Overs| KXIP 183/4 |RR vs KXIP, Live Cricket Score of IPL 2019 Match: Rajasthan Royals Sets a Target of 185. Speaking after the game, Dhoni had said: "I never expected the wicket to play the way it did. It was too slow and it just reminded me of the 2011 Champions League wicket. After the IPL, we came back and we had a really good season, but the wicket got relaid and all of a sudden we found it very difficult. "I feel if the wicket stays like this, it will be tough for us also. The wicket definitely needs to be a lot better than where it is right now. Even with dew, it was still spinning big. I feel it needs to be high-scoring, even the opposition would have known that it was a slow wicket." "Something close to 140-150 is something you are looking at. 80, 90, 100 or 120 is really low-scoring and if you have genuine spinners in your line-up, it's very difficult to score runs. I feel the wicket needs to be much better than how it is now," Dhoni had said. Echoing Dhoni's sentiments, Kohli had said: "It wasn't easy to bat on, though it looked a much better surface. I thought 140-150 would have been an ideal score, especially with dew expected later on. "The pitch was under covers for four days, but we should have batted better. 110-120 would have been a fighting score."